Diego Armando Maradona is by many regarded as the greatest player in the history of the game. He was born on October 30th 1960 in Lanus outside Buenos Aires. There he played for Los Cebollitos (The little onions), before he joined Argentinos Juniors. At 16 he was Argentina's youngest-ever international when he played against Hungary. Two years later he captained the World Youth Cup winners and was soon transferred to Boca Juniors for £1.000.000. The success continued and he was voted South American Player Of The Year in 1979 and 1980. In 1982 Maradona joined Spanish giants Barcelona for a world record transfer fee of £5.000.000. The same year the World Cup was held in Spain and Maradona made his World Cup debut on his new homeground Estadio Nou Camp. The tournament didn't end as Maradona had hoped and he was sent off against Brazil in the second phase, as Argentina bowed out. In his first season for "Barca" he helped them win the league, leaguecup and the Super Cup. Two years later, another world record fee of £6.900.000 took him to success-starved Napoli, and in 1987 they won a league and cup double. A year earlier he had captained Argentina to a second World Cup triumph. It was a World Cup that forever will be synonymous with Maradona. He scored 5 goals in that tournament, including two against England. Both are among the most controversal in World Cup history. The first was the infamous "Hand of God" and the second probably the greatest goal ever scored in a World Cup game, as he ran from his own half showing magic displays and leaving seven English players for dead. Success continued with Napoli as he again steered them to a leaguetitle and in 1989 even a triumph in the UEFA cup. In 1990 the World Cup was held in Italy and Maradona captained Argentina to yet another final. The Germans were once again the opponents and this time they proved too strong for the Argentinians. That loss was to be the beginning of the end for Maradona. Two drug scandals have created black spots on his name and reputation. Several come-backs have been tried since 1991 and after helping Argentina qualifying for the 1994 World Cup in USA, Maradona looked fit for fight again. A marvellous goal against Greece in the first match gave proves for that. But in the next game against Nigeria he was caught for drug abuse, and the World Cup story of Diego Armando Maradona got a sad ending. That match meant that Maradona equalled the record of matches played in the World Cup of 21, held by Uwe Seeler and Wladislav Zmuda (Later beaten by Lothar Matthäus). 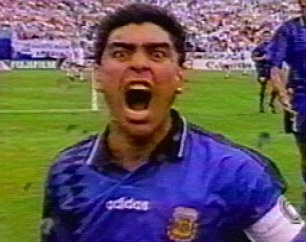 Maradona retired from international football after that with a gallery of good and bad memories. But he is by neutral football lovers regarded alongside Pelé as the greatest player of them all. Nicknames: "Dieguito" , "El Pibe de Oro" , "Pelusa" , "D1OS"
Last edited by MagicDip on Sun Nov 16, 2014 4:55 pm, edited 5 times in total. General update in both sets. Nickname: "El Pibe de Oro" , "Pelusa"
The last set is Naka's, I don't know him well for that 93-94 era. What do you suggest in passing for the 3 sets ? I mean, he was a great passer, yes but does he deserve SPA 95 and LPA 96? About LPA, had he the same level in that aspect like Pirlo(One of the best long passers ever)? By the way, I'm looking too... What about his AGG? LPA is too high, IMHO 93-94 max he was worse than Platini or Pirlo in this. Why shot stats in Napoli era are worse than early days set? Ok, it would be good to update this thread..
For the 80-82 set, I'd maintain SPA/SPS as they are and update LPA: 88 , LPS: 81 , the Konami values.